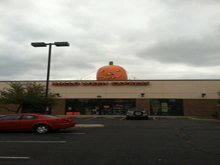 Welcome to Halloween Express Cincinnati, OH! This Halloween remember if you are looking for the latest and greatest for Halloween stop by and check out our selection of costumes, masks, wigs, decorations and props. We are ready to provide you great customer service while making this the best Halloween yet! We are currently closed for the season, but would like to wish our customers a fun and safe summer! Its that time of year again! Time to decorate the house, and dress to impress! Columbus' own family owned and operated HALLOWEEN EXPRESS franchise is very proud to announce that we will have the first ever Halloween store of this caliber with a centrally located store downtown! This location sits on the corner of 5th and Grandview Avenue, and is thrilled to be easily accessible the residents of the OSU campus, German Village, Short North, Upper Arrlington, as well as anyone else in the downtown area that is on the hunt for all things Halloween! Drop in to see this epic costume superstore, and have a ball sifting through isles and isles of Halloween costumes, wigs, make-up, props, accessories, and much more! Our expert staff and on sight creative team, will be ready and willing to help you make your 2016 Halloween one to remember! Happy HALLOWEEN EXPRESS, Columbus' locally owned, independent fanchise is thrilled to announce our repeat location in the Dublin/Columbus area for 2016! For the second year running, we will be located in the Tuller Square Shopping Center on Sawmill Rd, just a few doors down from Target. This store is stocked with a multitude of costumes, wigs, masks, props, make-up and more!! Everything to satisfy any hearts desire, and the friendly and imaginative staff within is unmatched in their ability to help you find exactly what you're looking for! We look forward to another great season in this location, and are excited to see all our returning guests, as well as to greet and welcome in new ones! Happy Halloween everyone! Columbus' own HALLOWEEN EXPRESS is excited to announce a new store location in the Carriage Place Shopping Center near the corner of Bethel and Sawmill Rd. You can find our store right between Half-Priced Books and Petland! This vast family-owned and operated store boasts an amazing array of costumes, props, make-up, and accessories as well as the same knowledgeable, creative, and attentive staff that you're always sure to come across in our stores! They are ready to help you find and create the perfect costume look, or the perfect decorative set-up, to make your 2016 Halloween the best one yet! 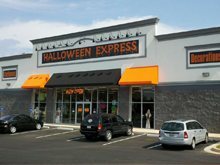 The same vast selection and impressive customer service you have come to love from Columbus' own HALLOWEEN EXPRESS can be found at our Hilliard location in the Mill Run Shopping Center on Fishinger Rd. Situated next door to Discount Tire, this location is a quaint shopping spot where you can find everything your Halloween heart desires! The super friendly staff is ready and willing to take you right to the product you're looking for, or can help you create something completely unique too! There's an amazing array of costumes, accessories, props, make-up and more to choose from! Swing on in and we'll help you create a look that will knock 'em dead this Halloween! Halloween Express would like to wish you a Happy Halloween! We are back serving Ashland, South Point, Huntington and Ironton with your all your Halloween 2016 needs. Be sure and stop by our store in the old K-Mart on Country Road 406 beside Tractor Supply for the best masks, costumes, decorations and props around! We are preparing the store for a great Halloween! Watch for our opening in September! Halloween Express, Located in the Midway Plaza Shopping Center just down the street from La Comedia Dinner Theatre. Exit # 38 off of I-75, the Springboro, Franklin Exit. We are excited to still be Dayton's greatest selection for not only Halloween, but for your drama productions and spirit week! Halloween Express has the largest selection of wigs, props, decorations, costumes and masks in the Dayton area! Be sure to stop by and let our friendly staff help you find everything you need to make this the best Halloween yet! Halloween Express is your locally owned independent franchise store who supports the community and its efforts.